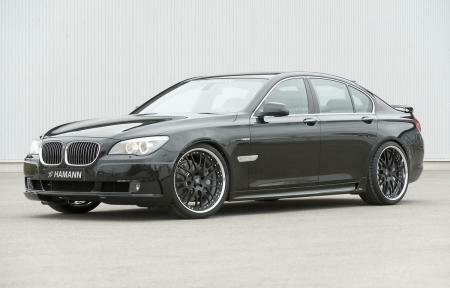 HAMANN presents its refining programme for the new BMW 7-series of the model range F01 and F02. Already since 1986, the Laupheim-based company develops and produces products for the individualisation of BMW automobiles. 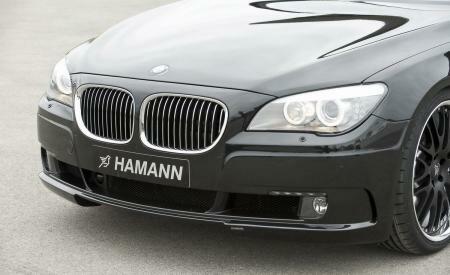 Thereby, the HAMANN technicians profit from hundreds of successful motor sports participations. The competence which was gained there is the basis for the development of new HAMANN products and renders the highest level for product quality and processing. The result: stainless steel exhaust systems with a sporty and earthy sound, aerodynamics components reducing the lifting forces and striking light alloy rims from 19 to 22 inches. Interiors perfectly fitted with leather and combined with floor-mats in matching colours as well as non-slip aluminium pedals extend the accessory range. 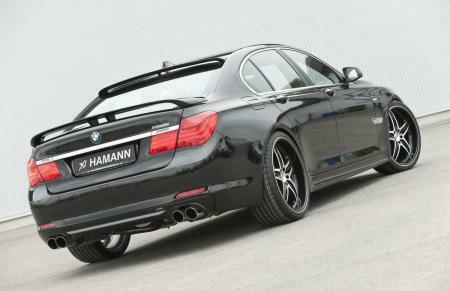 Already when establishing the design, HAMANN perfectly adjusts the individual components of the aerodynamic pack. The result is an exciting styling with an optimised air flow across the car silhouette. LED daytime running lights which are integrated in the new front skirt, render a sporty-dynamic look and increase the passive safety. Simultaneously, in combination with the roof spoiler and the rear spoiler, the lifting forces are reduced and give the upper class limousine a new, attractive overall appearance. The visual connection between the front and rear part are the HAMANN side skirts which are available for the model series F01. The optionally available rear shield insert for the side skirt of the model 730d and 740i allows fitting the four-pipe sport end muffler. Four round stainless steel end pipes with a diameter of 90 millimetres perfectly enhance the rear part of the 7-series BMW and produce a powerful, earthy sound. In addition to the existing, serial interior equipment, HAMANN accessories made first-class aluminum, pedals and foot-rests render motor sports air and perfectly match the embroidered HAMANN floor mat set. If desired, even a complete leather equipment can be produced with expert precision.